We usually keep the conversation strictly SMS over here on the Slick Text blog, but today we ran across an interesting piece over at HubSpot titled, Why We Unsubscribed 250K People From HubSpot’s Marketing Blog and Started Sending Less Email. In this blog post, the writer diagnoses a common email marketing problem called “graymail”. You know those emails you receive that just don’t pique your interest? You don’t loathe them enough to unsubscribe, but you also never engage. For example, I (Kristen, the Director of Content Management over at Slick Text), frequently get emails from a popular department store chain. Although I think to myself “maybe someday I’ll actually take advantage of their email offers”, I know deep down I never will. Now, how does this long winded story apply to you and your SMS marketing efforts? Are you doing everything you can to qualify your SMS marketing subscribers? Are you prioritizing quality over quantity? Are you firing out offers that are truly considered valuable, from a subscriber’s standpoint? If you answered no to any of these questions, it’s time for you to do some reevaluation. See, just like graymail, there is also such a thing as “graytext”, in the SMS marketing world. If your SMS offers are bringing in little to no redemption, you probably didn’t qualify your subscribers from the get go. They probably really don’t care about your mobile offers, and don’t plan on engaging, at least in the near future. Partner up with our rockstar SMS marketing team. Give us a call at 1.800.688.6290, or head over to our pricing page and sign up for a free plan. We want to help you build a quality list of SMS subscribers who obsess over your mobile offers. P.S. Only partner up with us if you really think SMS can change your business. 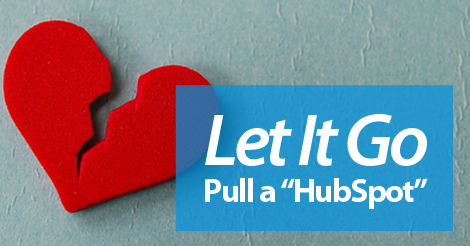 Don’t force us to pull a “HubSpot”, and break up with you once we find out you’re totally uninterested in our service.